We wait all year for that one week when we leave our hectic lives behind and hit the beach to soak up the sun and ride the waves! 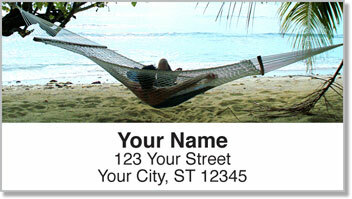 Now you can be reminded of vacation time whenever you prepare outgoing mail. 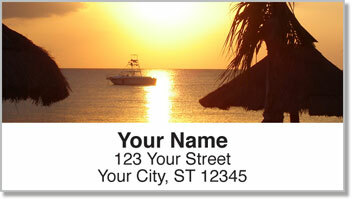 These attractive address labels feature scenes from a charming tropical resort. The images reflect those peaceful places where you forget about annoying technology, bills, cleaning the house and anything else that is part of the doldrum of your daily routine. 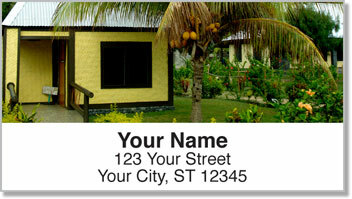 You'll love how these mailing labels are conveniently self-adhesive. Because of that, you'll never need to scribble out your return address on an envelope again! Just peel and place. It's a little less time spent on one of those tedious tasks. 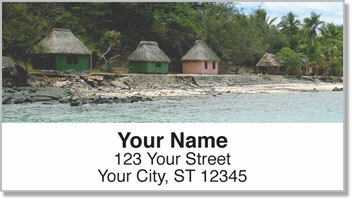 Get your very own Beach Hut Resort Address Labels today! Make it complete with a set of matching personal checks.